Sick of apps and games that force you to socialize every single aspect of your experience? Much rather play a game in your own little phone microcosm, and skip out on features like OpenFeint? On the other hand, if you’re constantly bombarding people in your social circle with what you’re up to, and want Facebook to be your be-all, end-all hub of online activity, then you’ll probably love it. And for my part, I wasn’t a fan. Not at all. For starters, putting up hurdles between potential users and your product is a good way to turn them off. And for the anti-Facebook crowd, not even being able to have the option of playing without an account is sure to burn some bridges. 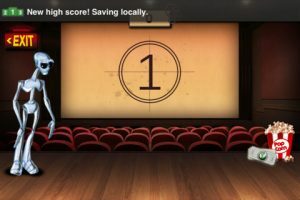 Developed by Digital4You, Freakdroid is a sort-of companion to Freakbop. Both games are part of the developer’s “Freakverse,” which currently just consists of these two apps. 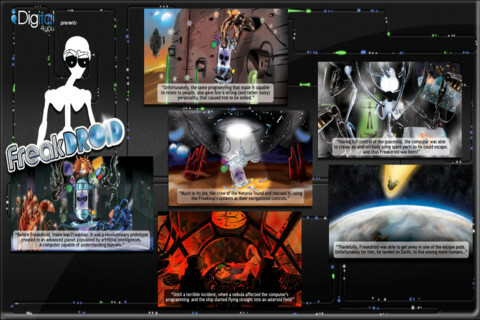 In Freakdroid, you’re ostensibly testing your wits against a wise-cracking robot. Who knows more about films? You’ll have to play him to find out. While it’s awesome that new questions are added every day (and the Openfeint leaderboards are included, if you like that sort of thing), the comic element is a frustrating addition. It’s funny, in truth, but boy is it hard to read. 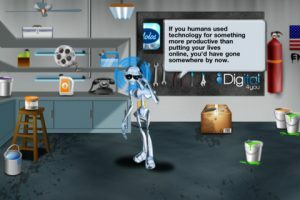 The robot does have some funny bits of dialogue, but even his snappy comebacks and put-downs aren’t enough to elevate this sleepy, convoluted iPhone app into stellar territory. And a confusing navigation system doesn’t help matters either. While the overall package has a lot of charm on the outside, Freakdroid is ultimately not a satisfying gaming or social experience. 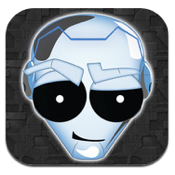 Freakdroidis compatible with iPhone, iPod touch, and iPad. Requires iOS 4.3 or later.